Drupella are snails with shells up to 5 cm long that are covered in small spikes or bumps. 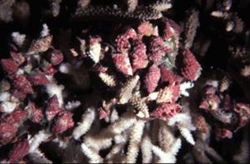 The shells appear off-white to brown but can sometimes be pinkish to purple when overgrown with red coralline algae. They are commonly found living on corals in reefs throughout the Indo-Pacific. They are frequently found hiding in cryptic crevices during the daytime. Drupella eat live coral tissue by stripping the tissue from the coral skeleton and leaving white feeding scars that can quickly become covered by algae. Feeding scars can have detrimental effects on coral growth. Drupella prefer to feed on fast-growing species with complex, branching growth forms such as Acropora and Pocillopora,ref but will feed on most corals in the absence of their preferred species. ref Studies in Kenya found them most commonly associated with massive Porites and more common in heavily fished reefs than fisheries closures in MPAs.ref Drupella generally form clusters on dead branches of live coral colonies, deep in crevices, under corals, or on dead corals. These clusters range from a few snails to over several thousand individuals. Outbreaks of Drupella can cause significant mortality on coral reefs. For example, in western Australia and Japan, Drupella outbreaks have drastically reduced coral cover. ref In northwest Australia, Drupella caused extensive mortality, destroying 90% of corals in parts of the northern reef at Ningaloo Reef. ref Overfishing on Ningaloo Reef may have caused the Drupella population to increase, due to decreased predation by fish (e.g., triggerfish, porcupinefish, wrasses, snappers, and emperor breams), which was also recorded in Kenyan reefs where their numbers increased greatly in the 1980s. ref Although Drupella outbreaks do occur, typically Drupella occur in lower densities. However, even at lower densities Drupella can still influence the structure of the reef. Similar to crown-of-thorns starfish, Drupella may also help to maintain coral diversity by grazing down faster growing corals (e.g., Acropora) to allow for slower-growing species to become established. It is unclear what causes outbreaks of Drupella, but human impacts such as terrestrial run-off, overfishing of Drupella predators, and increased reef damage along with natural causes (variable larval recruitment) have been suggested as potential causes. ref The periodic outbreaks suggest some relationship with oceanographic oscillations (e.g., El Niño Southern Oscillation). Methods to control Drupella are not widely documented. Management plans that address the threat of Drupella outbreaks typically include monitoring the distribution and abundance of Drupella over regular intervals (annually or every several years depending on severity of outbreaks) or research on the distribution and abundance of key predators of Drupella. A study in the Florida Keys that addressed removal of another type of corallivorous snail (Coralliophila abbreviata) from corals found that corals where snail aggregations were removed maintained significantly more live tissue area than those where snail aggregations were left in place. ref These results indicate that small-scale removal of corallivorous snails may be an effective conservation measure, although other considerations must be evaluated such as costs/benefits of removal and the role of snails as prey for other reef species.